ADELPHUS, (Fifth Century), believed to have been the tenth Bishop of Metz, he succeeded St. Rufus (7th November) ruling the See for seventeen years. Unfortunately, nothing certain is known of him, as all information on his life was added to the various martyrologies at much later dates. Hence, the aforementioned is really based upon conjecture; however, the existence of his cultus going back to an early date is without question. ALBERIC, a hermit in Italy who reposed circa 1050, and whose relics are enshrined in the Benedictine San Anastasio Church in the Roman Catholic Diocese of San Marino-Montefeltro. Nothing further is known of him. CANDIDA, (Date Unknown), one of a group martyred on the Ostian Way outside the gates of Rome. Her relics were enshrined in the church of St. Praxedes in the ninth century. She has been variously described as both a virgin martyr and simply a martyr, but nothing is actually known about her. EDWOLD, St. Edwold was most likely the brother of St. Edmund the Martyr, King of East Anglia (20th November). He lived as a hermit at Cerne, in Dorsetshire, in the latter half of the ninth century, and after his death was venerated as a saint. No further information on his life is known to us. EUTHYMIUS, (Fourth Century), a Roman who fled to Perugia with his wife and son, St. Crescentius (14th September), during the Diocletianic Persecution. He reposed in Perugia in the early fourth century. MEDERICUS (MERRI), born in Autun in eastern France to a noble family, he received monastic tonsure at St. Martin's in Autun at the age of thirteen, eventually serving as its abbot. The last few years of his life were spent as an anchorite. He is said to have reposed circa 700 whilst on a pilgrimage to the tomb of St. Germanus of Paris (28th May). St. Medericus is the patron saint of Paris’ Right Bank and the Église Saint-Merri located in Rue Saint Martin in the 4th Arrondissement of Paris commemorates his name. SABINA of ROME, it seems she was a wealthy Roman widow who was converted by the pious example of her Christian servant St. Seraphia (29th July). St. Sabina was most likely martyred during the persecution under Emperor Hadrian (circa 127), and the historical Basilica di Santa Sabina all'Aventino on the Aventine Hill in Rome is dedicated to her. SABINA of TROYES, commonly thought to be the sister of St. Sabinian of Troyes (29th January). According to tradition she was baptised in Rome by the future Pope St. Eusebius (26th September); but as her parents were still pagans, she decided to join her brother in Troyes. Nearing the city, she heard of his martyrdom and prayed that she might join him soon in heaven; and she is said to have reposed immediately upon completion of her prayer circa 276. SEBBE (SEBBA, SÆBBI), St. Sebbe was joint King of Essex with his brother Sighere, from 664 to 683. Following Sighere’s repose in 683, St. Sebbe ruled as sole King until 694, when he abdicated the throne and entered the monastery of Westminster (the present-day Westminster Abbey), which he had founded. 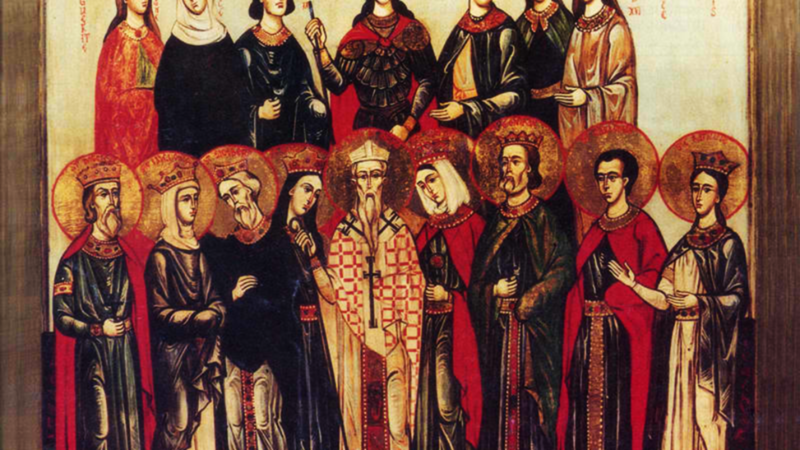 St. Sebbe spent the next three years in prayer and repentance. He reposed in 697 and was buried in St. Paul’s Cathedral in London. His tomb survived the fire at St. Paul’s in 1087, and his relics were translated to a black marble sarcophagus in the mid-twelfth century Unfortunately, his relics did not survive the Great Fire of London in 1666. A plaque commemorating St. Sebbe was erected in the Wren designed cathedral. VELLEICUS (WILLEIC), (Eighth Century), an Anglo-Saxon abbot who joined St. Swithbert (16th March) in his evangelisation of the Germans. St. Velleicus later served as Abbot of Kaiserswerth, in present-day Düsseldorf Germany.